Anthony Abeson one of the most respected acting coaches and teachers at work today. His has conducted group acting classes and private coaching for actors in New York City for over thirty years. His actor-training is an amalgam of his work with Peter Brook, Jerzy Grotowski, Lee Strasberg, Stella Adler, and Harold Clurman. Many of his students have gone on to successful careers in theatre, film and television. In his book Acting 2.0 he discusses the consequences of the American acting culture's emphasis on using rather than developing talent. 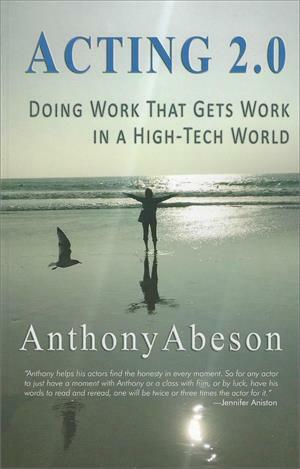 The subtitle, Doing Work That Gets Work in a High-Tech World is indicative of one of the main thrusts of the book. An actor's goal is to increase the humanity of the audience by virtue of the actor's own humanity. But the humanity of the actors, so essential to the humanity of their audiences, is under assault from the pervasive, dehumanizing influence of technology. In the opening of his book he says "I want to empower you with practical tools with which to do good work that gets work in the room work on the stage and screen that inspires all of us, that arouses not prurience or violence but that precious something, intangible but of inestimable value, that is being destroyed from our lives: our humanity." This is also an attempt to remind actors of their ancient and magical heritage as runways of the human spirit and thus to counter the overemphasis on looks and Twitter followers in casting. Anthony Abeson is a highly credentialed acting coach and teacher based in New York City. After graduating from Columbia University and membership in the Directors Unit of the Actors' Studio, he went on to direct theatre companies in New Zealand, New York and Washington, D.C. With directors Peter Brook and Jerzy Grotowski, he participated in theatrical projects in France, Poland and the US before returning to New York to join the drama department of the High School of Performing Arts (the "Fame" school) where he taught students like Jennifer Aniston and Esai Morales, among many talented others. He is the author of Acting 2.0: Doing Work That Gets Work in a High-Tech World.